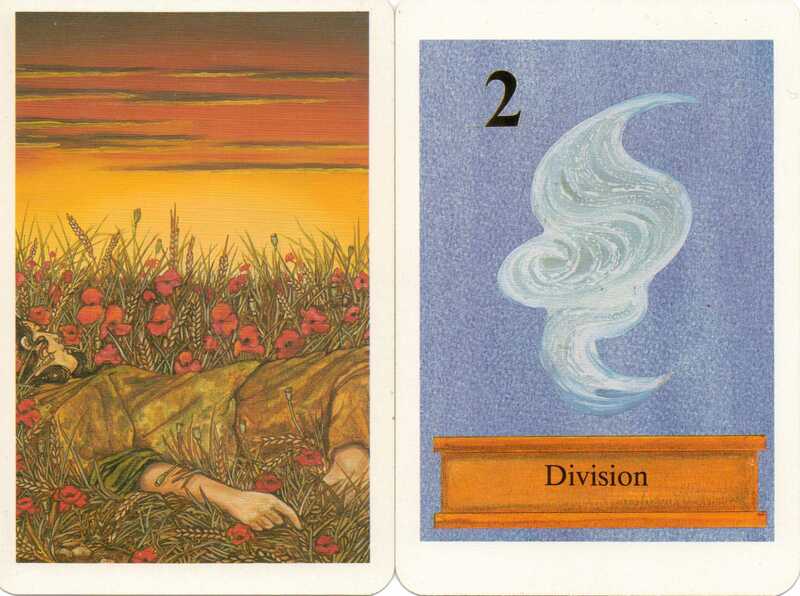 This week I will be using the Dreampower Tarot created by R.J. Stewart and illustrated by Stuart Littlejohn. It was published by Aquarian and although it is now out of print, can usually be found second-hand. It’s a deck which has an alternative take on the majors. The majors are very well illustrated and represent quite intriguing ideas. The minors are very simple in design in comparison. My first impressions are that it looks most suitable for deep readings rather than more mundane concerns. The Sleeper is a beautifully evocative image which speaks of dreams of potentials still to be realized. It represents the ‘unawake’ state most of us spend our lives in – going about our daily lives but not being fully ‘awake’ to the potentials within us. The 2 of Sylphs represents the in and out breath. It is the division into two parts which brings about change. These two parts make up a synergistic whole so that on some level the separation is illusion. These cards echo some advice I received yesterday. As I stand on the threshold of change, there are potentials I am still unaware of, dreams I have which are not yet realized. One of the solutions which represents itself is not to see my situation as an either/or but as 2 parts which are both equally necessary to achieve balance.